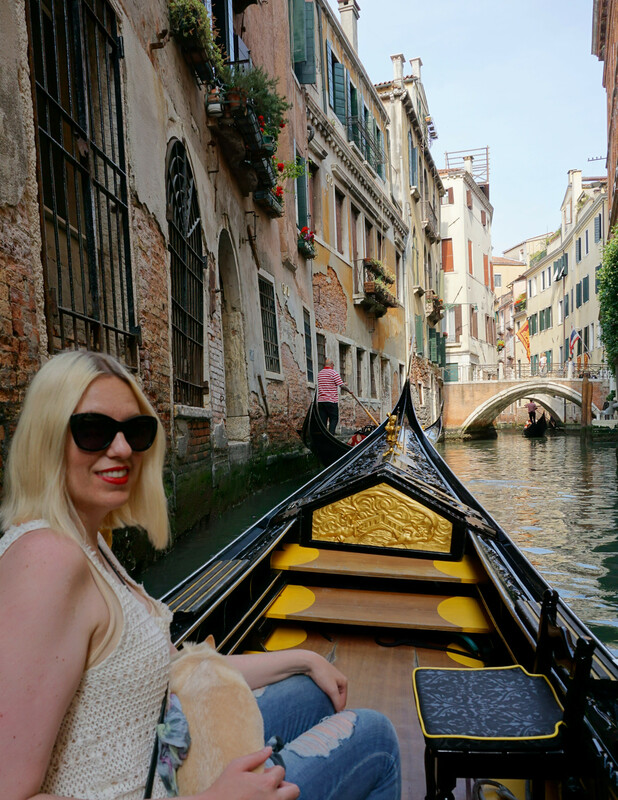 Venice was my dream place I had to experience when me and Daniel started planning our travels through Europe with our chihuahua Coco. With beautiful winding streets and gondolas, I have always thought of Venice as one of the most beautiful and romantic cities. We decided to book 3 days in Venice out of our month long trip in Italy. Most people will tell you 2-3 days is the perfect amount of time but I’d recommend a few more days. There was a ton of stuff we wanted to see but just couldn’t get too. 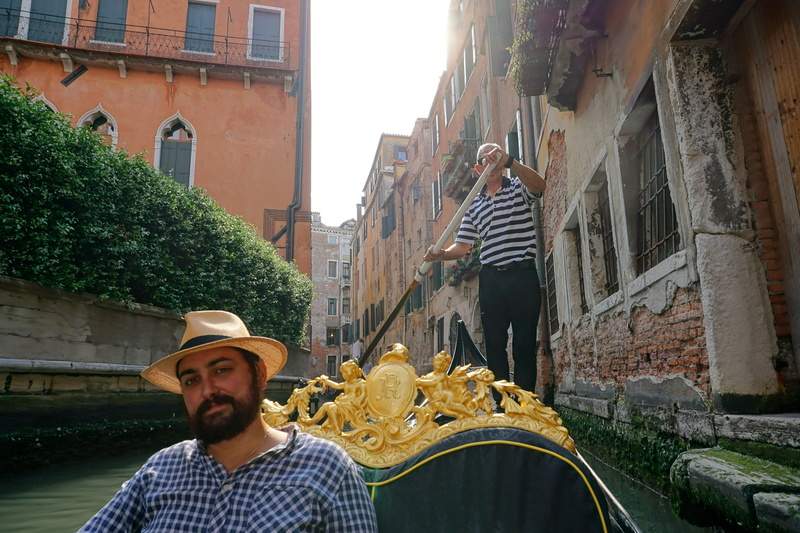 If your idea is just walking around the city and going on a Gondola ride, sure 2-3 days will probably be sufficient. If you love museums, like we do, you might want to book a few extra days. 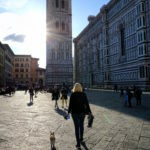 We found an amazing deal on a dog friendly hotel, Hotel Noemi, for only 89 euros (around 100 dollars at the time) a night, including the dog fee. We were super stoked to find our ‘room’ was actually a one bedroom apartment located in the heart of Venice with a window view overlooking a canal. 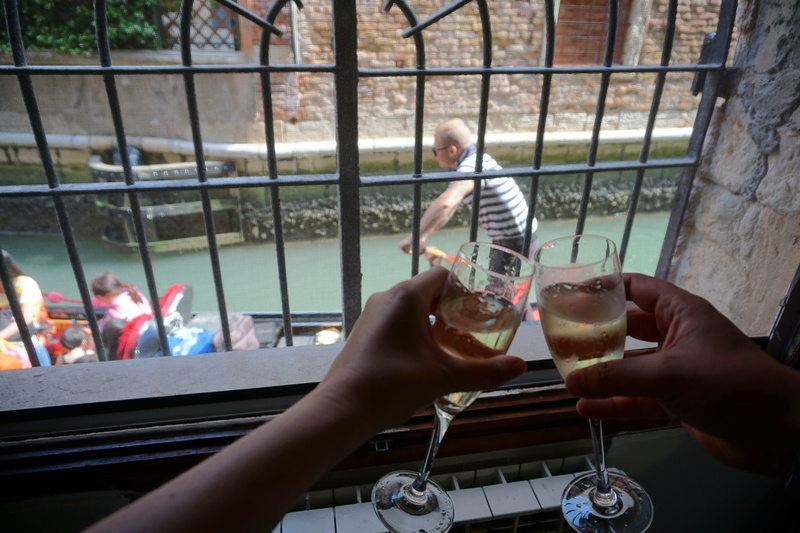 It was a wonderful experience to wake up, pop a bottle of hotel-provided prosecco (starting the day off right), and enjoy the gondolas passing by. 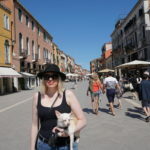 I was pleasantly surprised that the streets in Venice weren’t crowded with people when we arrived in mid May. The streets are very narrow and I can imagine hordes of people ruining the trip for us. We were really lucky with our trip to Italy in general, with less crowded streets and wonderful weather. I figured the nice weather would be the perfect time to enjoy a gondola ride. 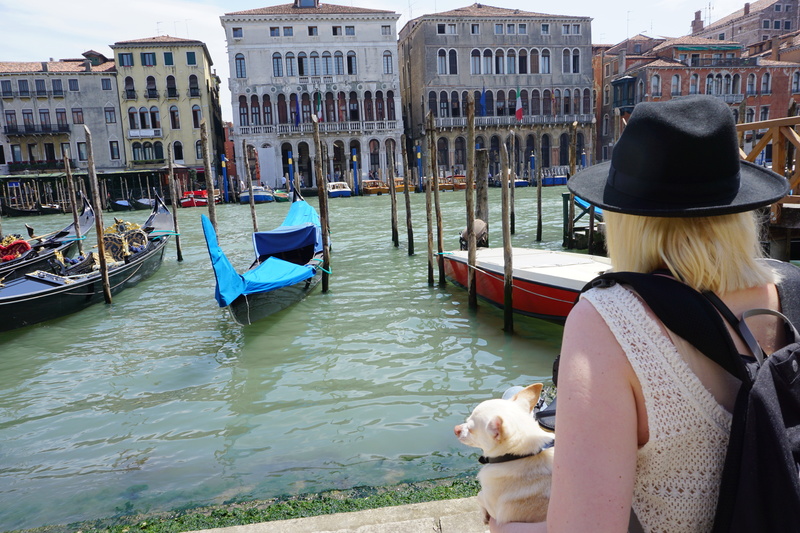 When we approached a gondolier we asked if he would allow Coco. He said. 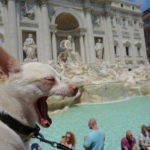 “of course,” which seemed to be the the popular response to almost anywhere in Italy we wanted to bring our dog, besides most museums. Venetians have a long tradition of owning dogs. Just look at the works of Titian, Tiepolo, or Carapaccio (just to name a few) and you will often see a dog in them. The waters were very calm and Coco seemed very relaxed sitting in my lap. Gondoliers own and maintain there own boats. The career and craft of the boat is often passed down generation to generation. They are required to wear black pants, a striped shirt and closed dark shoes so they are easy to spot. Make sure you have a camera handy when on the gondola. Every part of the canal was beautiful. 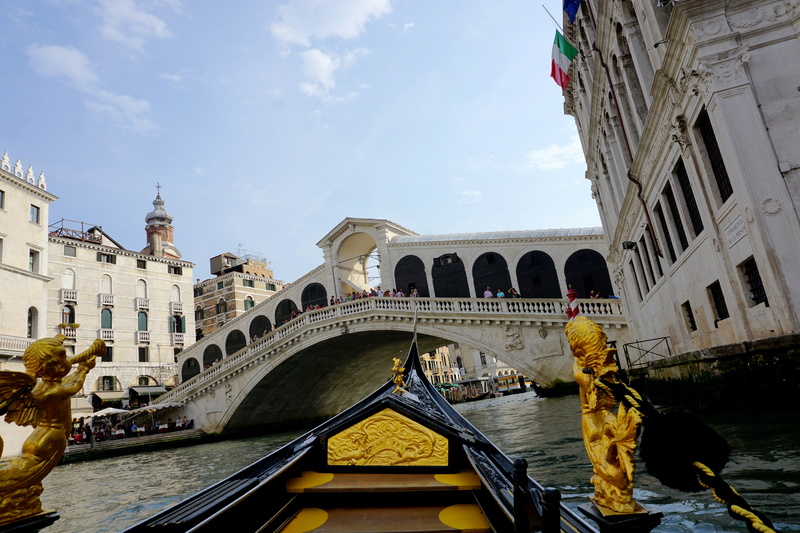 We passed under one of the most famous bridges in Venice, the Rialto, situated in the heart of Venice. The current structure was built in just three years between 1588 and 1591. 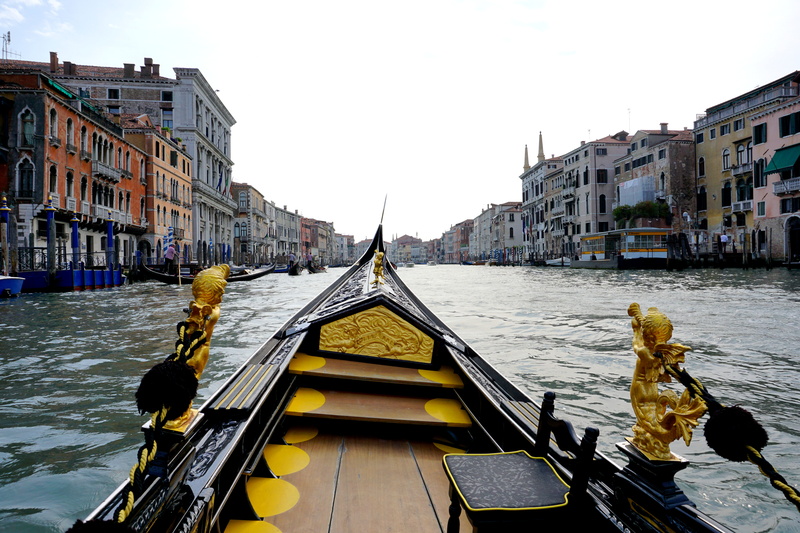 Even though the gondolas are expensive, they are a beautiful, romantic experience and truly the best way to see Venice. 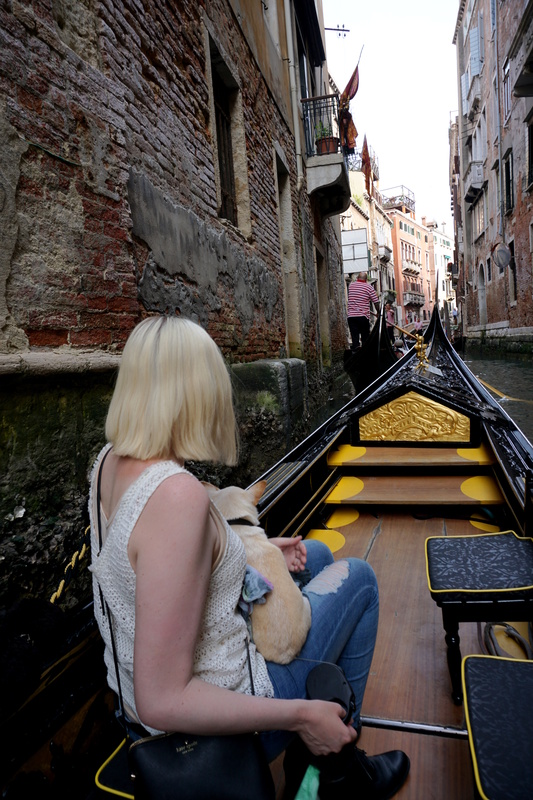 Where else can you get an authentic gondola ride (with your dog too) through the canals of a city more than 12 centuries old?